I've always been fascinated by Physics. It was my favorite subject in school - even more than Computers. I admit, we did have a young, attractive Physics teacher who would sit with me after class to discuss things beyond our syllabus... but no, that was not why I liked the subject. Physics looks at explaining why the world is the way it is. The other sciences - Biology and Chemistry, are confined to studying the world the way it already is. So while Chemistry includes Organic Chemistry that studies how carbon molecules connect to each other to form rings and long chains, some of these amino acids (the basic building blocks of life); and Biology talks about the way carbon based life evolved on Earth from a hot soup of such amino acids; they don't go where Physics does - answering how that carbon got here in the first place. Physics answers that, and makes us realize the larger picture. The carbon in us humans, animals, plants, or Iraqi oil, all came from the same place - the insides of a star. And we are not just made of carbon - there is a lot of far more exotic stuff in and around us - far heavier elements. Physics answers how these elements themselves came into existence. That's what I like about Physics - it deals with the fundamental - "Why is the universe the way it is?" Everything else is a study of things as they are, given the way out universe is. My interest in Physics would make me want to read the latest encyclopedias as a kid, and I'd often still be left feeling very unsatisfied. There were still a lot of questions in my head that would not get answered. Even today I often crawl through Wikipedia to learn more about the latest theories. Just that the equations are kind of scary. So why didn't I become a physicist? Well, being a scientist in India is tough - horrible red tape, favoritism, and lack of funding and facilities; means that you will never being doing very cutting edge research here, unlike the guys at CERN. My math is I also terrible - I've failed every single math paper in engineering at least once. So it is perhaps a good thing I never thought of becoming a physicist. Also, to be anyone on the Physics scene other than an unnamed lab guy, you have to be brilliant, and maybe a little eccentric. Anyway, my interest still continues nonetheless. It has driven me to read some great books in the past few years - A Brief History of Time by Stephen Hawking, The Universe: A Biography by John Gribbin, A Short History of Nearly Everything by Bill Bryson, and most recently, The Elegant Universe by Brian Greene. What's nice about these books is that they are all written in layman's terms and do away with the horrible equations involved. They allow you to understand the complex theories physicists are working on today, at a high level, through some great examples and analogies. So if you ever wanted to know more about the Big Bang, black holes, Einstein's Theory of Relativity, Quantum Theory, String Theory, and all the strange things they imply, these are some books you should have on your reading list. Books like these, and a general interest in Physics, make me think at times about various theories, and I try to visualize how the universe may actually be. If you have a non-existent social life and a vivid imagination, such things tend to happen. Enough rambling. So how exactly are we all, literally, made of stardust? Well, it was physics that figured out that for the Sun to be emitting the sort of power it does - 383 yottawatts (3.83x1026 W), it sure as hell can't be burning oil. No, not because the Intergovernmental Panel on Climate Change said it better clean up its act; or because yottawatts sounds too cool to be an acceptable measure of power. The fact is, if the Sun was literally "burning" any fuel in the normal sense of the word, given its mass, it would have burnt itself out in 20 million years. Considering it's been around for another 4.55 BILLION years after its expiry date, something sure is wrong with that model. It's only as recently as the 1920s that we carbon based life-forms figured out that the Sun may be running a fusion reactor under the hood. The type we really want to build here on earth, but also the type that can destroy an entire city if it isn't controlled. A thoroughly scaled down version, of course - 9.15x1010 Megatons of TNT exploding every second will not be very useful to us. Here's what about 10 Megatons of TNT exploding looks like... the Sun is this x 9,150,000,000. So Physics figured out nuclear fusion, and Einstein's famous e=mc2 (also Physics...duh) explained how that fusion reaction was converting a little mass into a whole lot of energy, and keeping the Sun going. Nuclear fusion in the Sun works by combining Hydrogen atoms to form Helium, for the most part - called the proton-proton chain. The Sun also combines its Hydrogen and Helium to form heavier elements that it further fuses together to form even heavier elements... such as Carbon and Oxygen, and so on, but these reactions are a tiny proportion of all the fusion going on. As the Sun ages though, it's got less Hydrogen left to fuse and starts fusing Helium, and so on... again. The only problem is, it takes a lot more pressure and temperature to fuse together heavier elements. Higher pressure and temperature at the core is possible if the star is bigger, as there's that much more mass crushing down on the core. Our Sun is quite an ordinary star when it comes to size, and can't produce very heavy stuff - nothing beyond Carbon and Oxygen. Also, most of the heavy stuff will stay locked up in the core of the Sun, so how do we get it out here on Earth to form ourselves? The fact is, the Sun is not the first star to be around this part of our galactic neighborhood. In the almost 14 billion years since the Big Bang, there would have been several stars that formed and died where our Solar System exists today. 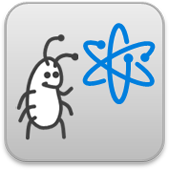 Starting out from the Big Bang, there was nothing heavier than Lithium-7 around - there was just a whole lot of Hydrogen. This Hydrogen settled down into clouds that slowly collapsed in on themselves thanks to gravity. As a cloud collapsed, it got denser, and its gravitational pull got stronger as even more Hydrogen fell in. It also started heating up as the Hydrogen atoms started colliding more and more frequently with each other as the pressure increased. This process continued till, at last, the pressure and temperature in the centre of that clump of Hydrogen caused atoms to start fusing together - and a star was born. 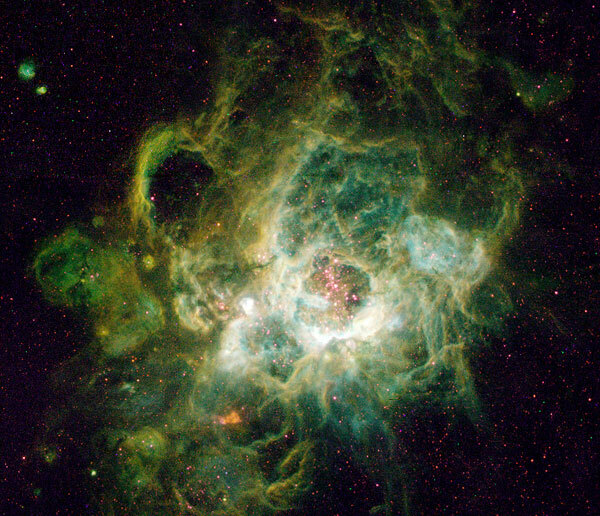 This is a Hubble Space Telescope image of a nebula called NGC 604, a site where new stars are being born. Now that star would have probably been huge, and the thing with huge stars is that they burn out really fast. So in a short period of time, thanks to the immense pressure and temperature at its core, this star would've burnt out its Hydrogen, and then Helium, and so on, to create elements as heavy as Iron. The thing about these massive stars is that they also die with a bang - a supernova. A supernova occurs when a massive star has spent its fuel, causing the internal nuclear reaction to stop. Without the enormous heat and pressure generated by the fusion reaction that held the core up against the outer layers of the star, the core collapses in on itself, producing the conditions needed for the fusion of heavy elements, and releasing a tremendous amount of energy - that blows off the outer layers in a spectacular explosion. A supernova can outshine an entire galaxy for that short period of time. The shockwave from a supernova can also carry heavy elements formed in this cataclysmic process very far. These blown away outer layers of stars form huge clouds - called nebulae - that are usually richer in heavy elements than other such nebulae. The cycle of star formation repeats itself, now using this metal-rich nebula as a starting point, slowly collapsing to form a new star. A couple of cycles later, our Sun, and its surrounding planets were formed from a cloud enriched by the violent deaths of stars in the neighborhood. And that is why we have lots of carbon here on earth, that formed molecular chains, to form amino acids, which tied together to form long protein molecules, that tended to split to create copies of themselves, or "reproduce", that slowly formed more and more complex structures, that slowly evolved over millions of years to grow fins, then feet, and then a brain capable of making sense of some of this stuff. PS: If you know of any more great books to read about that deal with Quantum Theory and Superstring Theory / M-Theory and related stuff, do let me know! The copyright for each book cover is most likely owned either by the artist who created the cover or the publisher of the book. The low-resolution images of the book covers used here are only to help readers of this article recognize the books mentioned, in the belief that this qualifies as fair use. 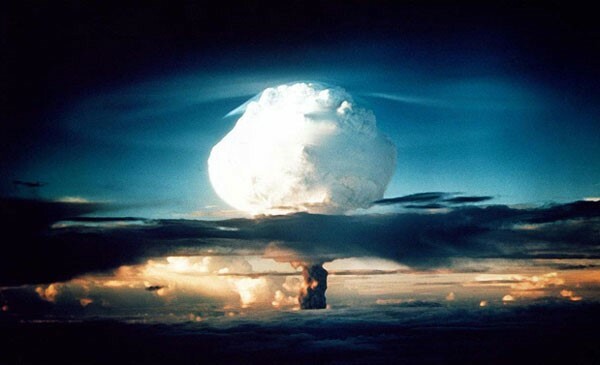 Images of the Ivy Mike nuclear test and the NGC 604 nebula have been taken from www.wikipedia.org, where they are specified as files in the public domain.